Emily was a member of the US County Performance and Risk Factors research teams. While at IHME, she earned her Master of Public Health at the University of Washington. 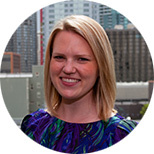 After IHME, Emily stayed in Seattle and went on to work at PATH as a Monitoring and Evaluation Specialist. Lim SS, Carnahan E, Nelson EC, Gillespie CW, Mokdad AH, Murray CJL, Fisher ES. Validation of a new predictive risk model: measuring the impact of the major modifiable risks of death for patients and populations. Population Health Metrics. 2015 Oct 1; 13:27. doi: 10.1186/s12963-015-0059-8. Hoy DG, Smith E, Cross M, Sanchez-Riera L, Buchbinder R, Blyth FM, Brooks P, Woolf AD, Osborne RH, Fransen M, Driscoll T, Vos T, Blore JD, Murray C, Johns N, Naghavi M, Carnahan E, March LM. The global burden of musculoskeletal conditions for 2010: an overview of methods. Annals of the Rheumatic Diseases. 2014 Feb 18. Norman RE, Vos T, Barendregt JJ, Linh BN, Huong NT, Higashi H, Carnahan E, Lopez AD. Mortality attributable to smoking in Vietnamese men in 2008. Preventive Medicine. 2013 Sep; 57(3). Murray CJL, Abraham J, Ali MK, Alvarado M, Atkinson C, Baddour LM, Bartels DH, Benjamin EJ, Bhalla K, Birbeck G, Bolliger I, Burstein R, Carnahan E, Chen H, Chou D, Chugh SS, Cohen A, Colson KE, Cooper LT, Couser W, Criqui MH, Dabhadkar KC, Dahodwala N, Danaei G, Dellavalle RP, Des Jarlais DC, Dicker D, Ding EL, Dorsey ER, Duber H, Ebel BE, Engell RE, Ezzati M, Fahimi S, Felson DT, Finucane MM, Flaxman S, Flaxman AD, Fleming T, Foreman KJ, Forouzanfar MH, Freedman G, Freeman MK, Gabriel SE, Gakidou E, Gillum RF, Gonzalez-Medina D, Gosselin R, Grant B, Gutierrez HR, Hagan H, Havmoeller R, Hoffman H, Jacobsen KH, James SL, Jasrasaria R, Jayaraman S, Johns N, Kassebaum N, Khatibzadeh S, Knowlton LM, Lan Q, Leasher JL, Lim S, Lin JK, Lipshultz SE, London S, Lozano R, Lu Y, MacIntyre MF, Mallinger L, McDermott MM, Meltzer M, Mensah GA, Micha R, Michaud C, Miller TR, Mock C, Terrie E. Moffitt TE, Mokdad AA, Mokdad AH, Moran AE, Mozaffarian D, Murphy T, Naghavi M, Narayan KMV, Nelson RG, Olives C, Omer SB, Ortblad K, Ostro B, Pelizzari PM, Phillips D, Pope CA, Raju M, Ranganathan D, Razavi H, Ritz B, Rivara FP, Roberts T, Sacco RL, Salomon JA, Sampson U, Sanman E, Sapkota A, Schwebel DC, Shahraz S, Shibuya K, Shivakoti R, Silberberg D, Singh GM, Singh D, Singh JA, Sleet DA, Steenland K, Tavakkoli M, Taylor JA, Thurston GD, Towbin JA, Vavilala MS, Vos T, Wagner GR, Weinstock MA, Weisskopf MG, Wilkinson JD, Wulf S, Zabetian A, Lopez AD. The state of US health, 1990-2010: burden of diseases, injuries, and risk factors [published online July 10, 2013]. Journal of the American Medical Association. DOI: 10.1001/jama.2013.13805. Lim SS‡, Vos T, Flaxman AD, Danaei G, Shibuya K, Adair-Rohani H*, Amann M*, Anderson HR*, Andrews KG*, Aryee M*, Atkinson C*, Bacchus LJ*, Bahalim AN*, Balakrishnan K*, Balmes J*, Barker-Collo S*, Baxter A*, Bell ML*, Blore JD*, Blyth F*, Bonner C*, Borges G*, Bourne R*, Boussinesq M*, Brauer M*, Brooks P*, Bruce NG*, Brunekreef B*, Bryan-Hancock C*, Bucello C*, Buchbinder R*, Bull F*, Burnett RT*, Byers TE*, Calabria B*, Carapetis J*, Carnahan E*, Chafe Z*, Charlson F*, Chen H*, Chen JS*, Cheng ATA*, Child JC*, Cohen A*, Colson KE*, Cowie BC*, Darby S*, Darling S*, Davis A*, Degenhardt L*, Dentener* F, Des Jarlais DC*, Devries K*, Dherani M*, Ding EL*, Dorsey ER*, Driscoll T*, Edmond K*, Eltahir Ali S*, Engell RE*, Erwin PJ*, Fahimi S*, Falder G*, Farzadfar F*, Ferrari A*, Finucane MM*, Flaxman S*, Fowkes FGR*, Freedman G*, Freeman MK*, Gakidou E*, Ghosh S*, Giovannucci E*, Gmel G*, Graham K*, Grainger R*, Grant B*, Gunnell D*, Gutierrez HR*, Hall W*, Hoek HW*, Hogan A*, Hosgood III, HD*, Hoy D*, Hu H*, Hubbell BJ*, Hutchings SJ*, Ibeanusi SE*, Jacklyn GL*, Jasrasaria R*, Jonas JB*, Kan H*, Kanis JA*, Kassebaum N*, Kawakami N*, Khang YH*, Khatibzadeh S*, Khoo JP*, Kok C*, Laden F*, Lalloo R*, Lan Q*, Lathlean T*, Leasher JL*, Leigh J*, Li Y*, Lin JK*, Lipshultz SE*, London S*, Lozano R*, Lu Y*, Mak J*, Malekzadeh R*, Mallinger L*, Marcenes W*, March L*, Marks R*, Martin R*, McGale P*, McGrath J*, Mehta S*, Mensah GA*, Merriman TR*, Micha R*, Michaud C*, Mishra V*, Mohd Hanafiah K*, Mokdad AA*, Morawska L*, Mozaffarian D*, Murphy T*, Naghavi M*, Neal B*, Nelson PK*, Nolla JM*, Norman R*, Olives C*, Omer SB*, Orchard J*, Osborne R*, Ostro B*, Page A*, Pandey KD*, Parry CDH*, Passmore E*, Patra J*, Pearce N*, Pelizzari PM*, Petzold M*, Phillips MR*, Pope D*, Pope III, CA*, Powles J*, Rao M*, Razavi H*, Rehfuess EA*, Rehm JT*, Ritz B*, Rivara FP*, Roberts T*, Robinson C*, Rodriguez-Portales JA*, Romieu I*, Room R*, Rosenfeld LC*, Roy A*, Rushton L*, Salomon JA*, Sampson U*, Sanchez-Riera L*, Sanman E*, Sapkota A*, Seedat S*, Shi P*, Shield K*, Shivakoti R*, Singh GM*, Sleet DA*, Smith E*, Smith KR*, Stapelberg NJC*, Steenland K*, Stöckl H*, Stovner LJ*, Straif K*, Straney L*, Thurston GD*, Tran JH*, Van Dingenen R*, van Donkelaar A*, Veerman JL*, Vijayakumar L*, Weintraub R*, Weissman MM*, White RA*, Whiteford H*, Wiersma ST*, Wilkinson JD*, Williams HC*, Williams W*, Wilson N*, Woolf AD*, Yip P*, Zielinski JM*, Lopez AD†, Murray CJL†, Ezzati M.† A comparative risk assessment of burden of disease and injury attributable to 67 risk factors and risk factor clusters in 21 regions, 1990–2010: a systematic analysis for the Global Burden of Disease Study 2010. The Lancet. 2012 Dec 13; 380: 2224–2260.